Virginia State rushed for nearly 350 yards and held Bowie State below 300 yards passing to remain perfect this season. Both Bowie State and Virgina State entered Rogers Stadium unbeaten on Saturday, but only one team would leave with a perfect record. VSU answered the call, beating BSU 47-35 to improve to 6-0 on the season. 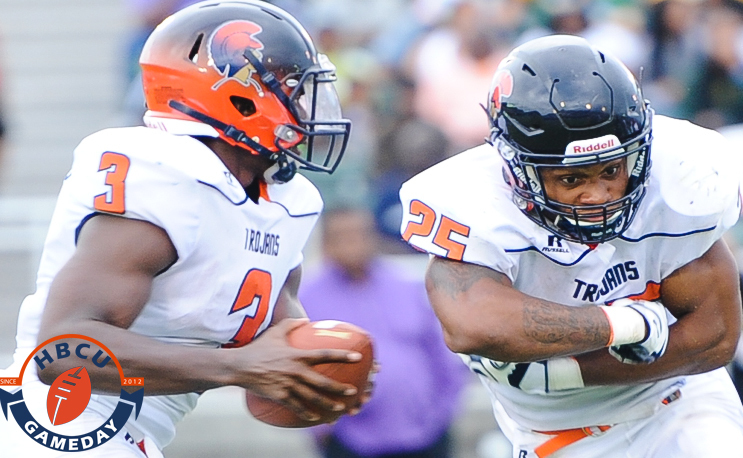 Quarterback Cordelral Cook accounted for five touchdowns (two in the air, three with his legs) and Trent Cannon finished with 234 yards to pace VSU as it avenged its most recent loss, a 38-37 loss to Bowie State on Oct. 15, 2016. VSU jumped out to a 20-7 lead over BSU in the first quarter, highlighted by a 93-yard run by Cannon. BSU managed to cut the lead to 27-21 at halftime, and the game went into the fourth quarter with that score as neither team could break through offensively. That all changed in the final period. VSU outscored BSU 20-14 in the fourth quarter as Cook scored on runs of six and 55 yards as well as a 36 yard scoring toss to Josh Harris to spark his team to its 10th straight win since last year’s loss to Bowie. Amir Hall threw for five touchdowns for BSU, but was held to just 281 yards, his second lowest output of the season.